There are now a great variety of wireless hard drives available, but so far only one is available at a true low-end price, offering an unprecedented overall value to the consumer, while being compatible with a wide variety of Macs, PCs, iOS devices, and Android devices. Behold the EMTEC P600 Wi-Fi Hard Drive. There are several factors that anyone may consider when shopping for a Wi-Fi hard drive, and there are plenty of comprehensive reviews of drives. The P600 wins big points in many of these areas, but it does fall short in a few other places. This P600 comes in both 500 GB and 1 TB varieties, giving you access to significantly more storage than iOS devices typically offer. While 500 GB or 1 TB seems like plenty of space, one may desire more at some point, but at this time that seems to be plenty for what you would want out of a mobile storage solution. 500 GB is enough for 80-100 compressed 1080p MP4 full feature films at 4-7 GB each or roughly 400 SD 480p films averaging around 1.25 GB each. You can upload and download almost every imaginable file type to the drive as well – even Apps. As for expansion, at this time I’m unsure whether or not the functionality of the device is baked into firmware in the enclosure or is on the drive itself and whether or not the drive uses any type of proprietary connection internally or simply uses a standard SATA 2.5″ connection. I’m not about to attempt to crack open the enclosure (at least not yet), but I feel it’s safe to say the drive is expandable. The enclosure itself looks an awfully lot like the Macally one below that comes with no drive, doesn’t it (just no red dot or embossed EMTEC logo on the top case)? In terms of drive speed, the EMTEC enclosures are equipped with standard 5400 RPM drives, versus going with a faster 7200 RPM drive, but this was likely done to preserve battery life. I can only image how much better battery life is with a SSD (if it can be upgraded), but more on that later. Overall, for the price, the drive size/speed are worth it. If I later find that this drive indeed can be swapped out for expansion or performance, I’d give this category a 5/5. Here is where this device has its biggest shortcomings. There is very little information about this device out there. The quick start guide is jumbled with loads of languages. The few illustrations and screen shots you are given to walk you through setup is just not enough. The website points to some videos that are not very helpful either and only point out the obvious things. I need to know more about the advanced features and am finding myself coming up short. Where are the instructions on working with a Samba or DLNA servers/clients? I still have a lot of unanswered questions about the more intricate features that could be leveraged after using all of the provided materials, and it shouldn’t be that way. For the novice users who just care about using iOS/Android, this device works well enough for you to fumble through things, but for the advanced user, the knowledge transfer completely falls flat. Again, with the DLNA advanced features, there are options baked into the EMTEC software (some which can only be accessed from the iOS or Android app), but there just aren’t enough configuration options to dedicate how the device functions in terms of streaming through web protocols. You are really on your own aside from the standard iOS/Android app. Thankfully, some points are made back on the GUI itself. The menus are easily navigated and designed well enough. The best part of the software is the ability to keep things bi-directional. You can upload or download the files you want from iOS and Android devices, freeing up storage as needed. You can also run multiple partitions (I made one FAT-32 to work with the PS3 and had hopes for the PSP, while the other was set to Mac OS Extended Journaled). This worked well. 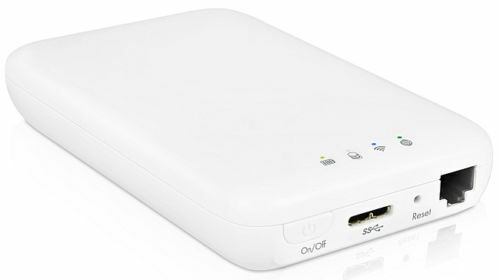 In terms of connectivity, you can even network the drive via Ethernet, making it an AP or endpoint for Time Machine backups while serving the dual purpose of being a wireless portable drive. The WiFi options are great as well and offer lots of ways to give you various levels of either security or compatibility. Unfortunately, there is no standard USB port on this drive. You get a micro USB 3.0 connection, which in itself isn’t bad, but why not just make it a standard USB 3.0 port and allow the battery to charge any mobile USB 2.0/3.0 device if desired – like the competing products do? The biggest area I feel that the device falls flat on in terms of software/connectivity is the seeming inability to stream iTunes purchased content to authorized devices. 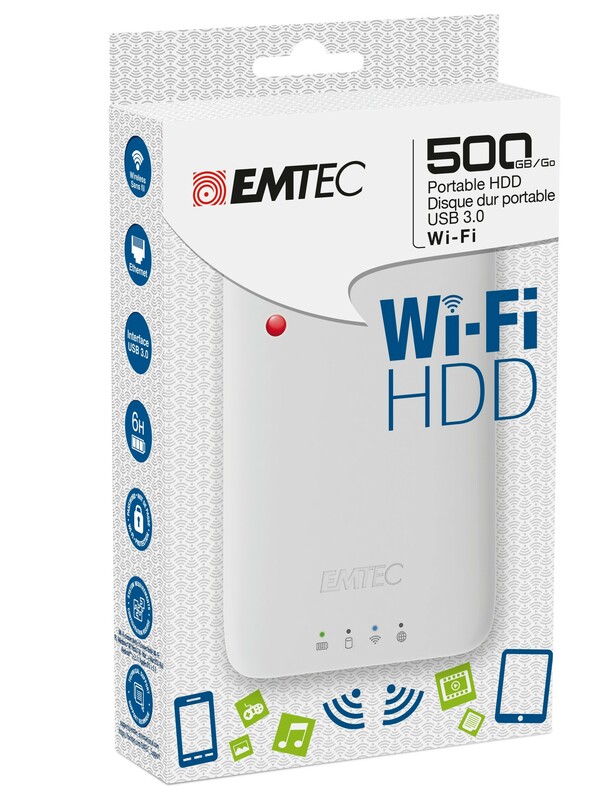 The Seagate Wireless Plus is at least able to get around this on iOS 6 and 7, so why not this EMTEC box? It’s a needless software limitation that could be enabled to at least mirror what the competition offers. Nonetheless, you can’t always have everything when budget is a concern. The Seagate drive comes in at roughly double the price (the 1 TB Seagate is currently $140 at Amazon.com), so you pay more and get more. Hopefully a future firmware upgrade addresses this shortfall. Overall though, not bad on software/connectivity. At least the device can be charged with a generic USB charger and doesn’t require you to have it connected to a laptop, provided it supplies 5V of power (the documentation suggests the 5V power supplied to transmit at least 2.1A though). This makes connecting to car chargers, etc. a potential option. The EMTEC Wi-Fi hard drive enclosure (and presumably the Macally enclosure) provide few network customization options (or at the very least, as mentioned, these options are just poorly explained), but in terms of network compatibility, these enclosures are second to none. You can make this thing work with any G3 or G4 running OS X 10.4 Tiger or 10.5 Leopard due to the fact that the drive is capable of 802.11b transmissions. This means that the original Airport Card is covered through anything modern. If you so desire, you can set the device to transmit 802.11 b/g/n, 802.11b, as well as 802.11g or 802.11n only modes. You can set the security to TKIP/WPA mixed or can up it to WPA or WPA2-AES for modern devices, or you can pull security authentication altogether. As you can see, these drives just about do it all as far as network compatibility goes. I just wish it could somehow work with the PSP or OS 9, but the browsers and Java on those devices are just too antiquated to function with the APIs for the drive’s firmware. Obviously, when considering speed, the more modern setups are faster, while the less modern configurations are slower. The faster speeds will translate to the ability to stream higher quality video, while the lower speeds will translate to less bandwidth and lower quality video. Overall, the mixed b/g/n with TKIP/WPA seems to offer the best spectrum of potential and adjusts speed according to the device type. There seem to be just a couple of opportunities I noticed. Aside from what was already called out, large wireless file transfers aren’t handled particularly well. I had the app crash a couple of times and just couldn’t get a 768 MB 1080p recording on my iPhone 5C to move over wirelessly (along with a few others over 100 MB). This is a minor complaint, however, as you can sync those with your PC 0r Mac; I’m still very satisfied due to the level of network compatibility offered. As mentioned, I’m not going to expect support any time soon for the PSP or Mac OS 9, but you can pull out your old iPhone 3G or original iPad and get right to it. This EMTEC drive and its app will go all the way back to iOS 4 for streaming support. Legacy Android users can equally rejoice. The EMTEC app will support all the way back to 2.2 (Froyo) for streaming support. PowerBook G4 users will be happy to know that Safari 4 and Safari 5 work fine with the firmware to allow for moving files back and forth. You just have to ensure your video codecs are fairly universal for content you create so that your iOS and Android devices can happily stream them, while your Macs can download or upload as needed. I have yet to try moving iTunes purchased content from the drive back to an authorized device for playback to deal with the no streaming issue for this type of content, but I can’t see why it wouldn’t work. The biggest problem I’ve seen so far that I have mentioned is configuration for DLNA. The PlayStation Vita, along with many other devices, should allow this content to be played. Configuring that transmission from the drive has proved elusive. Some more reading on the subject is definitely in order. I’m leaning towards the hunch that the problem resolution lies in needed plugins or in further configuration of media server software (will look into XBMC, Plex, Nullriver Medialink, etc. for ideas). The Vita might be out of luck for streaming and may have to resort to a cycle of uploading/downloading as needed. Overall, the level of compatibility for the EMTEC drive is stellar, despite some minor shortfalls that can be overlooked for now. After discovering all the caveats to those shortfalls, which I feel optimistic in finding (especially for the Vita and DLNA issues), many more devices could potentially enjoy streaming service rather than be stuck in a download/upload only holding pattern. If said caveats are discovered, the creation of better documentation is certainly in order and will be provided here. So far, battery life has lived up to expectations – roughly 4-6 hours of usage from what I have seen. This is on the low end for wireless hard drives, and there really isn’t any mention of the device being able to be used as a juice pack, but the spirit of this device lies in being a good media streamer when no WiFi is available (or at least no compatible WiFi) and is perfect for when you are stuck with limited entertainment options. Assuming you are able to keep this thing plugged in most of the time (for road trips, I’d suggest finding a 5V/2.1A USB charging solution to plug into your 12V socket), you need not worry about battery life. For being out and about though, the battery is limited. Grant it, this is current life on a 5400 RPM rotational drive. Perhaps the battery life is significantly better with a SSD if the drive can be replaced? The bottom line? How much is this thing? Why is it such a good value despite several misses? Simple! The current retail is $59.99 for the 500 GB unit and $79.99 for the 1 TB unit! For what you get, it’s a complete steal! The Macally enclosure by itself ranges between $39.99 and $69.99 depending on where you shop. You are basically getting the storage for free (or very cheap) by getting the EMTEC unit. That’s less than 1/2 the price of the Seagate Wireless Plus for not a whole lot of compromise. If I can sort out the DLNA issues and figure out what middleware is needed, this drive becomes a no-brainer for anyone who needs content on the go and does not want to be tied down to data plans or where Wi-Fi may or may not exist. I purchased my unit from Micro Center, but there are plenty of reputable resellers of these products. Ripping copies of discs you own to create your own digital copies on your Mac or PC and loading them onto this drive, while steering away from officially purchased/DRM digital content creates a pathway for getting the most out of this wireless hard drive. iOS and Android users will get the absolute best media streaming offerings thanks to the dedicated app. For 1080p streaming, stick with 54g or 150n speeds and ensure your iOS device meets the specifications (Example: iPad 3rd generation or later or iPhone 6 Plus/6S Plus recommended for display of full 1080p content). From EMTEC website and personal research. Supports up to 8 connected devices.